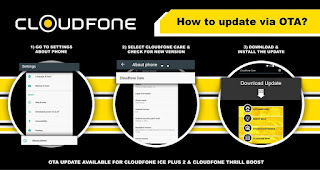 Here’s a good news for all Cloudfone Thrill Boost and Ice Plus 2 users, over the air (OTA) update is now available. No need for you go at any service center just to patch this update on your phone, as long as you have a strong internet connection with Wi-Fi or mobile data you can download it any time you want. As mentioned in Cloudfone post, the upgrade to the latest software version focus on enhancing user experience with Google Play and account access. Both smartphone are very budget friendly, as part of improving their service they continue to push updates to every Cloudfone user to enjoy hassle free browsing and downloads. Before you proceed to updating with this latest software, make sure you have enough battery power, stable internet connection and enough storage space to accommodate the downloaded data. 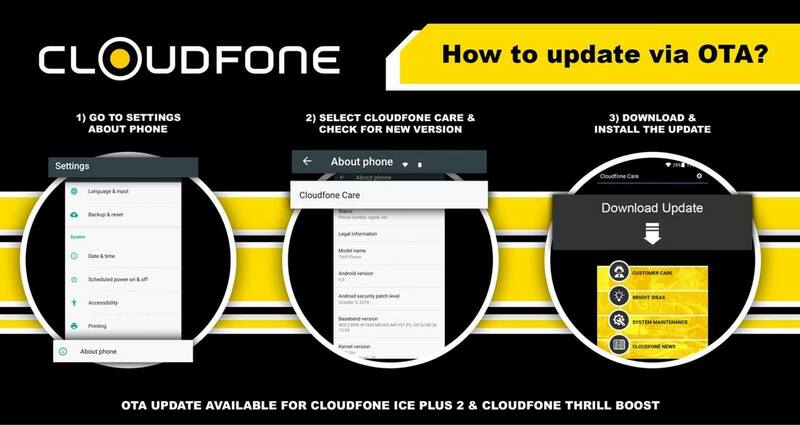 You can update your Cloudfone Thrill Boost and Ice Plus 2 via OTA by following these steps. Wait for a few minutes to finish the update, your device may reboot during the process and continue to initialize updates of your device firmware. How about naman yung cloudfone thrill X+005T? Wala pang upgrade para dito? ?